Karen is hosting this week's One Layer Wednesday challenge and in my opinion, it's just in time - A Free for All. Every once in a while we need to do something just for fun, with no limits or requirements. And this is fun, don't you think? You know I love a good rainbow and this was inspired by a logo that I saw on Pinterest. I masked and sponged the various shapes with distress inks and then I used an Eat Cake Graphics sentiment to finish it off. PS Yes, you can give in to temptation ... inside as outside! Wow. You do have a fantastic style Ardyth! :-) Ardyth, this card flashed up on my screen, and I immediately thought, "Ardyth!". So very cool! I love how you created such bold color on your one layer card, Ardyth. What an attention getter! Thanks for you sweet comments on my challenge cards. 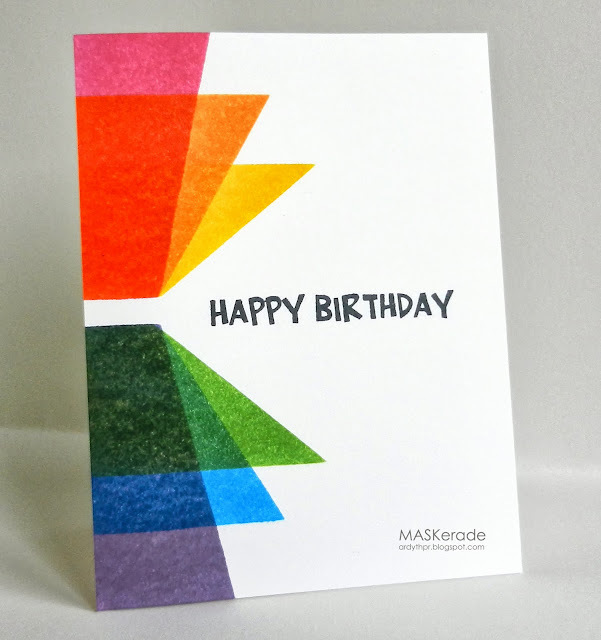 For a one layer card, this has got so much dimension - fabulous! Oh my, this is right up my alley! I share your love of rainbow colors! Such a beautiful rainbow of colors, Ardyth. Your design (as usual) is fabulous! And, I completely agree, a Free for All is just what we all need every once in awhile! This is bright, beautiful and fabulous. What a fun theme, too. It's been too long for me--I think I'll play along, too. So, so, so, so, so fabulous! Wow, Ardyth, your design is fantastic! The bold colors blend so well and so eye-catching! Good job! WOW! Now this is COOL, COOL, COOL!!! Using a larger image really showcases the overlapped sections of the colors! The design reminds me of a fan, unfolding to reveal the sentiment...so clevery creative! I would know this was your card anywhere. So perfectly stamped and graphic in nature. I don't know how you do it but you have the gift. So happy you played along and liked the challenge this week! This really is a fun card! I love the rainbow color palette (it's so "you") and the sentiment is just perfect! Ardyth, this is so very clever. And so pretty!